And my thanks to the wag on RateBeer who was hoping that this would combine his two favourite things – beer and hamburgers... 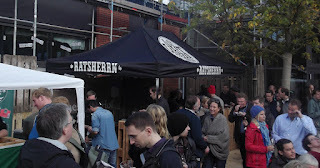 In reality it was a beer festival organised by the Ratsherrn Brewery in Hamburg, and featuring its own beer plus those of friends both inside and outside Germany. For non-Hamburgers, Ratsherrn is an old brewery name locally – it translates as Alderman or Councillor – but this is a brand-new incarnation, its first full brew being in April this year. It is based in the old Schanzen-Höfen wholesale meat market buildings, which are currently being refurbished to attract a variety of entrepreneurs and other commercial tenants. There's still builders fencing around and quite a bit of rough unpaved ground, plus the decorative trees are still wrapped in protective sacking, but enough's been done for there to be a usable courtyard, and that's where the festival was. Seven breweries took part, four from northern Germany plus Aarhus Bryghus from Denmark, Boston Beer Co (=Sam Adams) from the US, and Maisel & Friends, which is a craft beer spin-off from the Maisel's Weisse family brewery in Bayreuth, Bavaria. 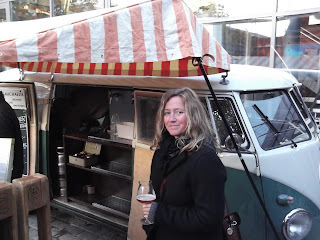 Most were serving from bottles, the main exceptions being Ratsherrn which had all four of its beers on tap, the other Hamburg City micro Blockbräu with two taps, and Klindworths which had its Landbier-Bus along – a twin-tap bar fitted into a VW campervan/microbus. Everything was one euro for a 100ml taste for a euro or €3 for a 300ml glass (about half a UK pint). Some of the beers were quite excellent. The longest beer lists were presented by Aarhus, whose 6% Klosterbryg was sort of an Abbey-Dubbel-meets-IPA and was excellent, and Ricklinger Landbrauerei. 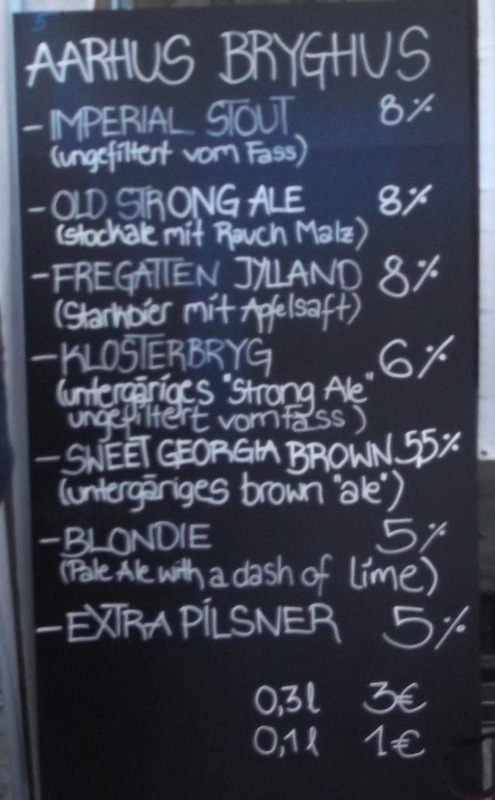 I've mentioned the latter's dark beers here, but its Rauchbier was also nice and its herbal Porsebier was well made although odd – a bit like drinking a good Helles bombed with a Jagermeister. The Sam Adams beers were good too. Alongside its Boston Lager and Fat Jack – the current seasonal pumpkin beer – it had its very tasty Whitewater IPA and one that wasn't in the programme: an interpretation of traditional Finnish Sahti called Norse Legend. (I don't think the Finns are actually Norse, but maybe Sam knows better!) This was rather intriguing – malty and dark, yet with earthy farmyard notes, kind of like a cross between an Old Ale and a Saison. The star of the festival for me though was the Pale Ale from Klindworths, a country brewpub which celebrates its Landbier – this is more a marketing term than a style, rather like “traditional country ale” for a British brewery – yet is not afraid to give it a big punch, and indeed to blend in elements from other related traditions. The Pale Ale is a gorgeous bitter in the modern style – a big hoppy bite, peachy malt bursting out, and a long sharp and refreshing dry-bitter finish. All in all, a great day out. Everyone was having fun and in a good mood. Yes, we were in an open yard and there was a brief rainstorm, but once it stopped – and even before we'd brushed ourselves down – members of staff came around offering rolls of paper towel to dry benches and tables. The only disappointment is having to wait until next year for Hamburger Craft Beer Day no.2! Just cos it's in a tent, does it have to be camp? Been shopping? No... I've been shopping.